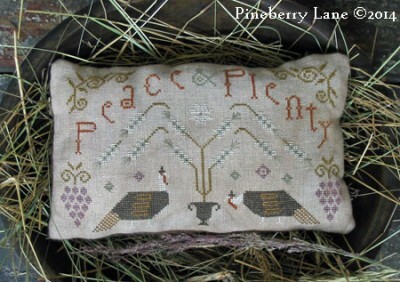 Celebrating an abundant harvest season, this little sampler pillow features an urn overflowing with wheat, generous bunches of grapes, fat turkeys (wearing pilgrim hats nonetheless! 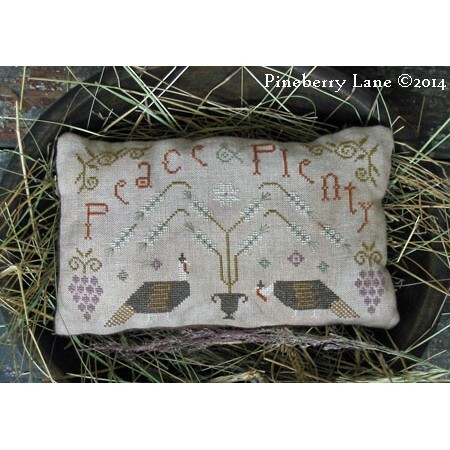 ), folky motifs, and wishes for Peace & Plenty! Stitched on 35 count Beige linen from Weeks Dye Works using DMC threads. Stitches include cross, straight, four-sided, and Algerian eyelet. Finished pillow size: 8.25”w x 5”h. Pattern includes a color photo, professional cross stitch chart with floss colors, optional aging instructions, diagrams for specialty stitches, and directions for making the sampler pillow.